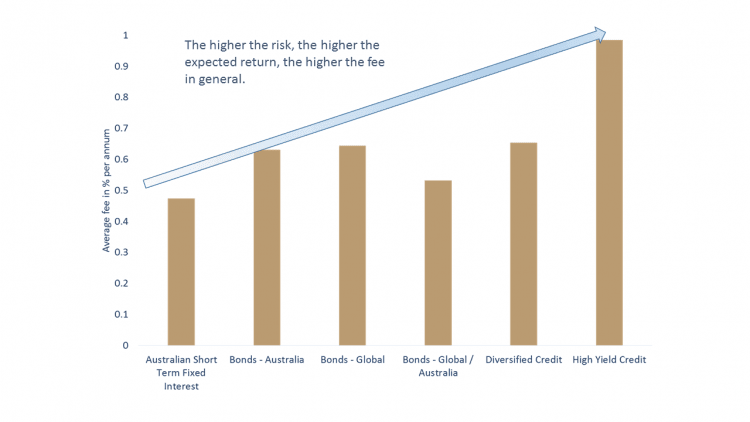 Fixed income funds available in Australia are not widely written about. In fact, this appears to be true of bond funds in general. In academic literature, there are very few papers written about the performance of bond funds in any part of the world. According to a recent report by Morningstar, fixed income managers (at least in the US) have expressed the view that the “ETF threat” to active management is more of an equity phenomenon. This may be for a number of reasons, particularly in Australia, where equity ETFs have been available for far longer than fixed income ETFs. 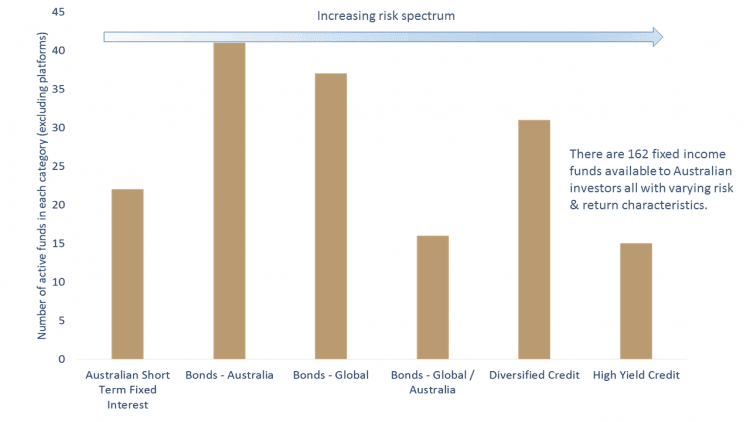 As a result, I decided to have a look at how active bond funds available in Australia are going and if you are considering investing, where might be a good place to look. Like equity funds, there are many categories of fixed income funds – usually defined relative to their benchmark index. All data we use is taken from Morningstar, as are the categories. Short term fixed interest funds – these are usually cash-like funds that invest in short term (i.e. those that have short maturities) fixed interest securities. Australian Bonds – these are funds that typically have their investment universe limited to bonds issued in Australian dollars (not necessarily Australian issuers). The index that is usually referenced is the Bloomberg AusBond Composite index. These funds can invest in government debt or corporate debt. Global Bonds – these funds usually use the Barclays Global Aggregate index to define their investment universe (which is huge). The funds can invest in government or corporate bonds. Global/Australian bonds – these funds will usually have a combined index of the Bloomberg Ausbond Composite and the Barclays Global Aggregate. This is because Australia constitutes a very small component of the Barclays universe and so it upweights Australian-dollar-denominated issues. Diversified Credit – will usually also reference the Barclays Global Aggregate index but will be limited to corporate debt only. It is not unusual to see these funds “swap out” (i.e. use derivatives to reduce their exposure to interest rates) so that their main source of return is the credit spread (or the amount paid over and above what investors are willing to receive on government debt). High Yield Credit – these funds invest in so-called “junk” bonds or non-investment grade debt. Ratings agencies rate many companies for credit-worthiness. Investment-grade debt is rated AAA, AA, A, BBB. Non-investment-grade debt is rated BB, B and CCC (all the way down to default). Most High Yield funds will concentrate in the BB and B rated corporate debt issuers. These funds are usually taking the highest level of credit risk (that is, the risk that the borrower fails to repay the debt). 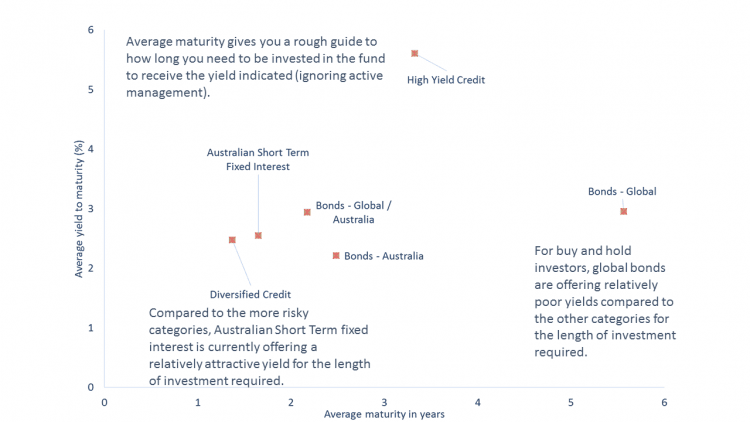 Short-term Australian fixed interest appears to be offering the best yield for investors given the length of investment horizon. Diversified credit is offering a comparable yield for a comparable investment horizon and high yield credit certainly looks like it is still offering some value. Whether they think interest rates are going up or down in absolute terms. Or put another way, how much interest rate risk they are willing to take at the moment. Where they think interest rates in different countries are going relative to each other (for example, US rates are expected to rise, Japanese rates are expected to stay the same). How much credit risk they are willing to take. How much to invest in different credit ratings or government versus corporate debt. Of course, there is much more to it, but these are the high-level risk factors in fixed income funds. Using Morningstar data, the past three to five years has not been kind to active managers in the fixed income space in all but two categories. So needless to say, across the majority of categories, investors have not received value for money when we look at incremental returns (i.e. how much you are being charged for the amount of excess returns being delivered, see our previous articles on incremental returns). Given the extraordinary rally in high-yield markets globally over recent times, as investors hunt for yield and hence push up the price of securities that are delivering some income, it is not really surprising that they appear to have delivered the best value to investors when looking at historical returns. Unfortunately, history is no guide for what investors can expect going forward. However, we can look at the current yield to maturity to give us an indication of what return to expect assuming that the investment is held to maturity. 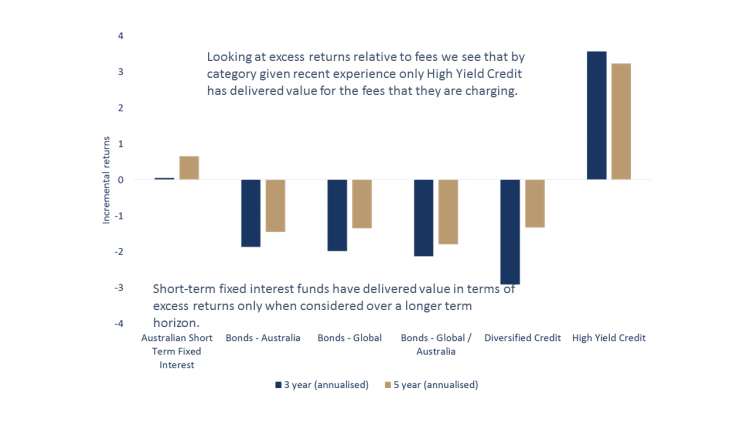 Short-term Australian fixed interest appears to be offering the best yield for investors given the length of investment horizon. Diversified credit is offering a comparable yield for a comparable investment horizon and high yield credit certainly looks like it is still offering some value – however, remember that there is credit risk as a risk factor that is not considered in this chart. 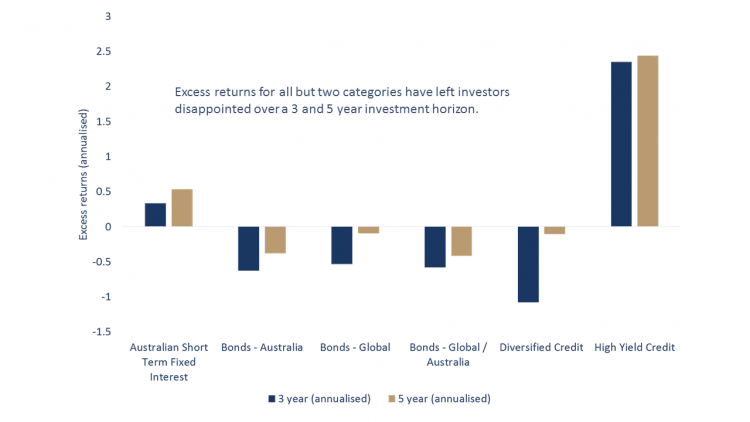 All of the bond offerings (Global, Australia and Global/Australia) are paying comparable yields to short term fixed interest, however, the length of time required to realise this yield is considerably longer, particularly for Global bonds where interest rates in the rest of the world are still low compared to Australia. But remember, yield to maturity is a guide only and gives you a rough rule of thumb for determining the return you can expect. 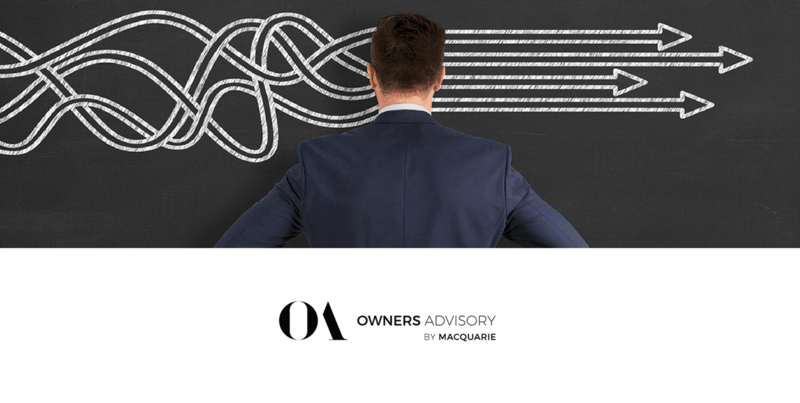 To view more articles from Owners Advisory, and receive their regular newsletter full of insights, sign up for a free account.